Final Tally: 23 issues left to complete the run. In an unexpected surprise, my collection reached a milestone this month as I’ve cracked the Amazing Spider-Man “Top 10” for the first time by acquiring ASM #9. While I’m not suggesting anyone should go about popping some champagne in my honor, the purchase still represents a major psychological hurdle that was cleared and is obviously now the oldest issue of Amazing Spider-Man in my possession. At the risk of sounding melodramatic, an acquisition like this was a laughable proposition for me when I first started getting into the hobby-aspect of my collection years ago. I still remember looking at a copy of Wizard magazine, which doubled as a price guide and pretty much any ASM comic worth more than a $100 appeared like an impossible get for me. Those in the first 10 were beyond preposterous. In my mind, the only people lucky enough to have those were millionaires and people who picked them up in the 1960s when they originally were on the newsstands. I used to fantasize about being able to go back in time to 1963 when Amazing Spider-Man first came out and going to a local newsstand and using my 1993 U.S. dollar to buy multiple copies of ASM #1 for 12 cents a pop. Talk about your smart investments. Of course, anyone who was a kid during that time will probably tell you they once owned those comics back in the day but their mother threw them out when they moved out of the house, just like my father swears to this day he had a Mickey Mantle rookie card that was tossed by my grandmother. The fact is, nobody who bought these comics when they first came out understood their future value. That’s what makes them so valuable now. Because you’d be damned to find a copy today that survived somebody’s mother. As I got a little older and the idea of spending a decent chunk of change of a single comic book became a more realistic proposition for me, I used to wonder which of the first 10, if any, I would come to own first. I was pretty sure it was either going to be #7 or #8, which are both highly collectible, but are a little more cost-efficient in that they’re among the only books in the first 10 that don’t feature any “firsts,” i.e. first appearances of major characters in the Spider-Man universe (ASM #5 features Doctor Doom, a character that had been introduced previously in the Fantastic Four series, but the issue is highly valued because it’s Spidey’s first battle with Doom, perhaps the most celebrated villain in the Marvel lexicon). 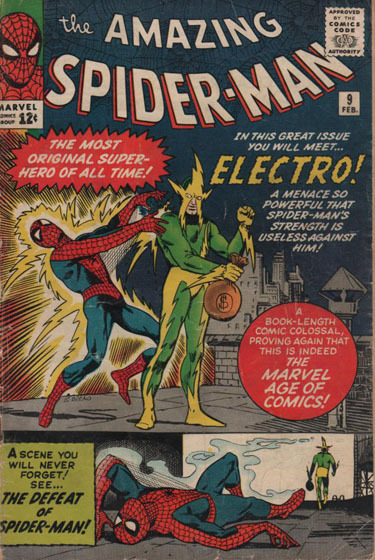 So, in retrospect, I’m understandably surprised that my first “top 10” issue is #9, the first appearance of one of Spider-Man’s most significant villains, Electro. 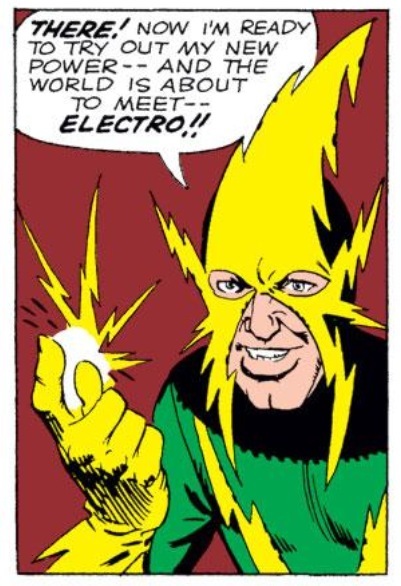 Electro is a prime example of how a simple back-story can still make an effective villain. He was a blue-collar guy working on a power line when he was struck by lightning, giving him the ability to control electricity. 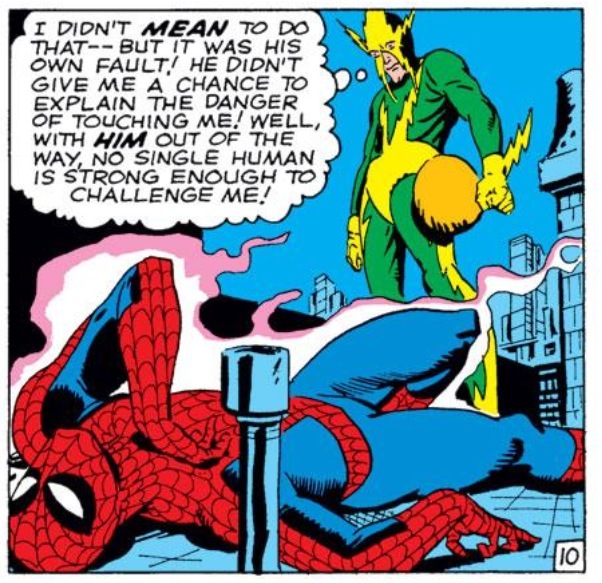 Rather than use these gifts for good, like Peter Parker does after he’s bitten by a radioactive spider, Electro uses these abilities for a life of crime. 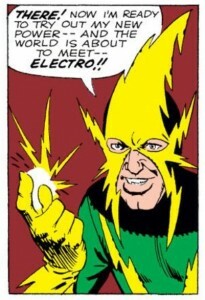 Sometimes, it just doesn’t have to be complicated, and I appreciate Electro for that. What made my acquisition of this issue, this month, even more of a surprise was the fact that nowhere in my brain did I think April was going to be a month where I finally cracked the top 10. I actually had already picked up issues 29, 38 and 47 from one of the online retailers I regularly buy from earlier this month, and was completely satisfied by the idea that I now owned every issue all the way back to #37 and I just had 24 more holes to fill. But due to fortuitous circumstances, I was able to come by a little extra cash this month using the art and craft of writing, so I casually logged on to eBay like I often do, just to see what else was out there. I have certain price points in my head regarding how much I’m willing to go for each of the issues I’m missing, so I’m always looking to see if there’s anything available to buy that comes well-below my target. And lo and behold, ASM #9 was just sitting there in the “Buy it Now” section. It must have been posted earlier that day or 24 hours earlier at the most, because the price was so nice, there’s no way it would have survived much longer if I had waited. Since I already had made my budgeted purchases for the month, I turned to my wife and sheepishly asked what she thought. While she’s always been supportive of my hobby, she’s also a total financial pragmatist. I explained to her the situation: the price I valued this book at versus how much the seller was actually asking for, and without hesitation she said “go for it.” It’s not often in these situations I get an answer without hesitation, so if she recognized the value, I knew I couldn’t let it pass. So now that this threshold has been crossed, it changes up my collecting strategy going forward. Previously, I was always working backwards, filling in all the holes I needed to so I could achieve milestones like everything back to 50, 40, 30, etc. But maybe I instead should be looking for whatever purchase gives me the most bang for my buck like ASM #9 did this month. I no longer have to consider the psychological aspects of working backwards and leaving the top 10 for the bitter end. Now, I’m just focused on the fun of the chase itself, finding new ways to grow my collection without destroying my bank account. Hey, I just saw your blog on ComicsShouldBeGood. Great stuff man, it’s always cool to see a person writing about something he has a passion for, especially when you happen to share that passion. One thing I enjoyed about this entry in particular was seeing how your approach to collecting differs from my own. I was 16 when I made the decision to pursue a complete run on ASM. I think I had a hundred or so issues at that point. Initially, I intended to collect all issues with Spidey or a spinoff character in the title role, but it wasn’t long before I kicked that notion to the curb, owing to financial realities and, to be blunt, the fact that some of those miniseries were so terrible that I couldn’t countenance the idea even of picking them out of the quarter bin. I still mean to collect Spectacular and Web Of, however. ANYWAY, coming round to the point, when I made the decision at 16, the first thing I did was to save all the money from my dinky summer job and blow the bulk of it in one big wad before school started on a G+ copy of ASM #1. This was my way of signing a sort of compact in blood to collect all the issues. It also mirrors the way I do work: hard first, then easy, that way it’s all downhill from the outset. Since ASM #1 was the launching point of my collection, and such a logical one at that, I was kind of stunned to see that you’ve gone all this time collecting WITHOUT snagging a copy for yourself. I mean, you intend to buy it one day, and typically these things only get pricier as time goes on, so why delay? Yet, after thinking about it a little, I begin to grasp the merits of your approach, in that you’re sort of ramping up to the big issues. I admit it’s harder for me to care about filling a gap with ASM #210, the first appearance of Calypso, when I already own ASM #15, the first appearance of Kraven. Your way puts a kind of forward momentum on the collecting. For dramatic and sentimental purposes, might I propose that you make ASM #1 the LAST issue you buy (unless of course you happen to be one of those nonexistent people who finds a copy in an old lady’s yardsale box for a quarter, in which case, by all means). A weird thought occurs to me. Although I’m missing about 200 issues, ten times as many as you, because of differences in our collecting habits, I’d wager we have roughly the same financial hurdle to clear before reaching the finish line. Anyway, all of this rambling and going on is to say that I’m very happy you made this blog. I will continue to follow your progress, and maybe, occasionally, chime in with a wistful comment or two about my own experiences – nothing as long-winded as this though, I promise. Happy hunting. Thanks for the kind words Cass. I haven’t necessarily worked backwards sequentially, but yeah, I guess I’ve set myself up by saving the really big stuff to the end. I didn’t get my first pre-20 issue until a few years ago with #17, and my first really, really big issue was #14 last year (I feel the big 5 “keys” are #1, #2, #3, #4 and #14). I think the plan at this point is to save #1 for the end and find a Good or Good minus for myself that’s not totally obliterated. But man, total kudos to you for snagging that #1 when you did. My problem has been, whenever I’ve had that kind of money saved and ready to go, something has always gotten in the way to keep me from bearing down and buying it. Funny how that works. 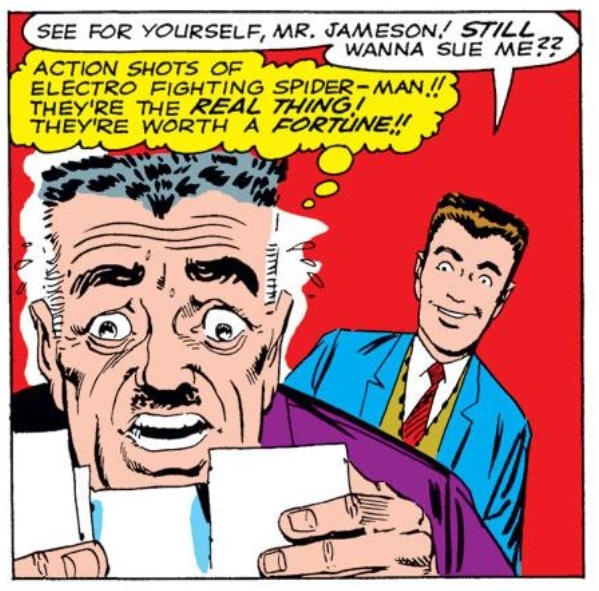 Congratulations on your first single-number issue of ASM! Being a true comic nerd, I have all my comics organized in a spreadsheet, and I noticed I recently passed 200 issues of ASM. The idea has really been developing in the back of my mind that maybe I should start a push to get every issue, although a years-long project like that seems kind of daunting. Plus, I can’t imagine my wife would be enthused. But stumbling across your site makes me think it might just be doable. By the way, my earliest issue is #16 (cross-over with Daredevil, still in his yellow costume! ), which I bought about 5 years ago, and even the beat-up copy I have is one of the prizes of my collection. Congrats on the #16 — for some reason, that’s one of the trickier issues for me to find in a lower-grade (but not an eye-sore) condition. Some day I’ll stumble upon it I’m sure. And I can understand not wanting to upset the significant other. If you stick around and read-up in the coming weeks/months, you’ll hear some interesting “spats” between my wife and I over comics.